Learn to use Form based authentication in Java EE 7 with, Wildfly 8 and Mysql database. This is a kind of JAAS authentication provided in Java EE applications to ease the developer work. In this Tutorial we will be creating an Authentication and authorization module for JavaEE application. We will be doing FORM based authentication. Following is Index for the series up to now. 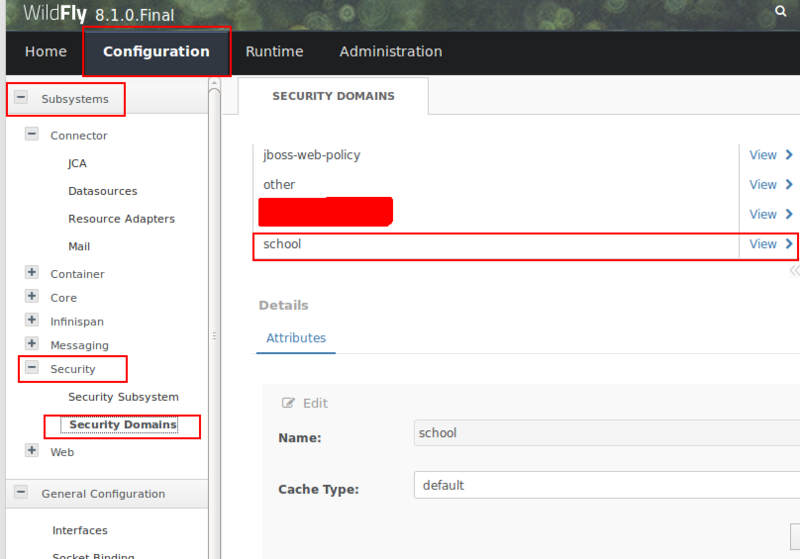 Create a security domain in Wildfly. Create security constraints in web.xml and configure it to use security domain. Create Login and Error Pages. We have already mentioned that we will be using a datasource created in earlier part of this series, once you have a datasource you can proceed to further steps. So now we are going to create a Security Domain. This can be done either using the text editor and editing the configuration file or by using the Administrator panel of wildfly. I am going to proceed in first way, by editing the configuration file. Open this file and search for the subsystem called "jboss:domain:security:x.y"(x.y) is the version number. This subsystem holds the security domains created in the system. Here we are going to create a new domain by the name of "school", as in the example application we have been creating til now we are using the school scenario. Use following code to create a new security-domain under this subsystem. the database table we are using here is simple, following code is the result of "SHOW CREATE TABLE [table-name]" query for the table we are using. NOTE: The little problem to know here is that we are focusing on both Authentication and Authorization both modules. When we are working with security. Most of the tutorials on internet only focus on Authentication part and in result user faces problem even after everything is alright. So just out of precaution that everything should proceed all right we are taking in account both Authorization and Authentication. The hashCode and hashAlgorithm used in our demonstration is using MD5 make sure the password in your database is hashed using this algorithm or you configure the application according to your needs. To know how to use hashAlgorithm in Java read this article: Using Encryption Algorithm In Java. NOTE: The queries written here are in the syntax of MySql queries, you should write the queries in the syntax of whichever DBMS you are using. Now we are telling about various parameters we are using in the domain. security-domain: This comes under the subsystem security-domains tag. This is used to represent one single security domain. the parameter it takes is name and cache-type. In the cache-type we have two options default and infispan, we are going to leave it to default. Authentication and Authorization: These are two different modules one is used for Authentication process and one for Authorization process. These have further properties which we know as module-options. Now we use these options to define the working of these modules. However there are parameters use. code, which we set to Database in case we want to use database as our source of operation. and flag which tells if the code part is required or optional. dsJndiName: This is a module option which tells the system to use the datasource in order to connect to a database. We pass a datasource JNDI as a value in here. SELECT [password-column] FROM [table-name] WHERE [username-column]=? SELECT [role-column], 'Roles' FROM [table-name] WHERE [username-column]=? hashAlgorithm: This tells the system to use a perticular hashAlgorithm to match against the password. This is an optional step but is recommended to ensure the security of password. hashEncoding: This is also an optional step but is necessary if you are using hashAlgorithm, this tells the system to use a particular encoding for the hash code generated by the algorithm specified in hashAlgorithm. Log in into admin panel. There will be a list of Security Domains available. Click on view for the domain you want to explore. In your web application you need to configure the web.xml in order to use the security domain, this is a step by step process. Define the type of Authentication process and configure it to use the security domain created in first step. Define the roles supported by the application. First thing first, expand your web application and look for WEB-INF directory. In eclipse it is located at, ApplicationRoot > WebContent > WEB-INF. In this create an XML file called "jboss-web.xml" and specify the name of domain to be used. After that in the WEB-INF look for web.xml and open it for editing. We need to define security constraint, authentication mechanism and roles in there. The complete web.xml will look like this once we are done. security-constraint: The holder of a whole constraint. web-resource-collection: This part defines the set of web resources which comes under a particular type of constraint. By web resources we mean the web pages. web-resource-name: This tag is used to specify a name for a constraint. url-pattern: Used to specify the access URL pattern for the web pages that comes under the restrictions of this constraint. http-method: Specifies the allowed http method on the resources under the url pattern specified above. auth-constraint: To bind the role type with this security constraint. role-type: Used with auth-constraint to bind the role type. We are going to use the FORM based authentication thus, first a login form and error page is required. We have created the login.xhtml and error.xhtml in the WebContent directory. The key part of your login page is login form which is of following structure. And the error page, you can design to please yourself. NOTE:The name of this file need not to be login.xhtml or error.xhtml, you can use whatever name you like. The classes in the code above are bootstrap classes, if you want to learn the use of bootstrap with JSF try this article: Applying Bootstrap to JSF based Web Application And to learn to create the template based application in JSF read this article: Template based View in JSF Web Application. Once you have login form and error page ready, you can use them in the login-config sections as shown in web.xml code above. login-config: To define the login mechanism. auth-method: To set the authentication method, we are using FORM. realm-name: The name of security domain we created and specified in jboss-web.xml. form-login-config: To specify the login configuration. form-login-page: url pattern to login page. User will be redirected to this page when trying to access a restrected url. form-error-page: url pattern to error page, user will be redirected to this page if the login credentials are not correct. security-role: To specify the security role. role-name: To specify the name of role. This is all now you shall be able to work out the application. Whenever a user will try to access the url which comes under a url pattern specified in security-constraint, the user will be prompted for the login to proceed. Please leave your queries or correct us if we did something wrong somewhere.